In the Video Snackbar, we are constantly looking for new ways to help our content creators reach their goals. We set up tests, prototype new technology and we experiment with new media workflows. A lot of this work is focused on single cam DSLR content, edited down to "snackable" one minute videos, but since the advent of streaming platforms such as Facebook live and Periscope, we are working more and more in the live multicam domain. Think iPhone instead of LDK8000, Laptops instead of OB Vans and 4G Bonding instead of SNG contribution. While conducting these experiments I found out that these solutions, born out of the streaming and gaming world, are becoming increasingly mature and performant, to the extent that they can play a prominent role in more traditional broadcasting environments. To find out up to which point the above statement could turn out to be true, I set up a collaboration between Canvas, Slash 9 and VRT's operational video department. 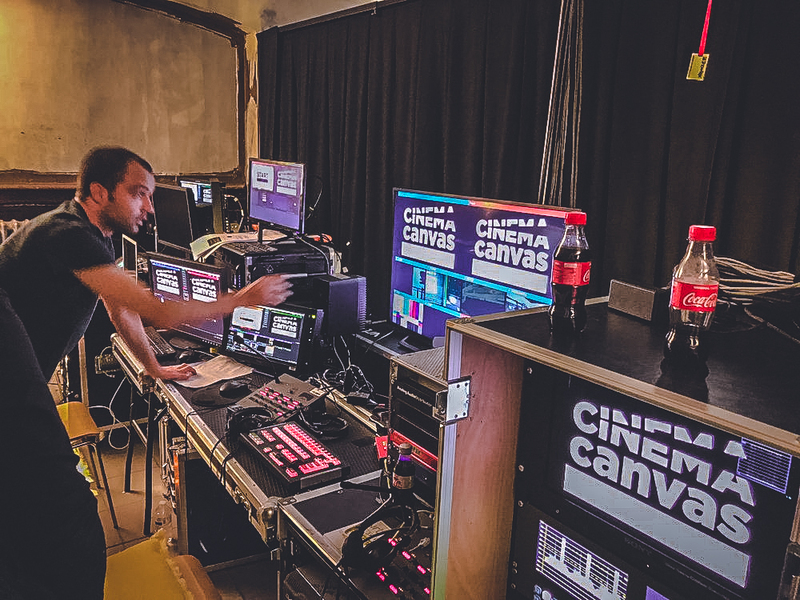 Together we produced the program Cinema Canvas, a 4 camera talkshow about classic movies. We used a vMix platform to do the recording of the show, the playout of the video clips, the video switching and the insertion of the on-air graphics. In a more traditional world this is done by 4 different devices, each of them operated by one person. In this test we were able to combine all these roles into one person, thereby already achieving a certain optimization. The camera's were GV LDX's which have an amazing low light performance, audio was routed and recorded over Dante. It was challenging to transform a compact vMix system, built for live-streaming into a performant mini OB-van without wheels, but it worked out fine. You can watch some of the episodes here! We did stretch the limits of the setup and currently I would say there's still some extra work to be done, in both ways. The vMix solution could've been adapted a tad more to a broadcasting workflow (latencies are confusing when a presentor is using the return image as a cue for his fixed introduction shot, codecs should be the correct compromise between quality and speed/availability (as the director wants to review the scenes immediately after the shooting) and filename conventions are there for a reason). On the other hand I feel that some of the hurdles we had to overcome were induced by trying to cram a new tool into an old workflow. I think if we are open and adventurous enough to review the whole workflow and build it around these new tools, we will be able to jump even further in workflow innovation, and to reach even more exciting goals with compacter crews of operational, content creational multifunctional superhumans. But that's for another test!